What Is Monastero Santa Rosa and Why Does It Win So Many Awards? Monastero Santa Rosa is both new and old. It is a modern hotel set in a restored 17th-century monastery. Much of the original architecture remains, lending the hotel a strong historic feeling. Hotel service at Monastero Santa Rosa is attentive and fully English-speaking. Various guest amenities included with room rates: a full breakfast; shuttle service to the beach and to neighboring villages; a strong wifi signal; mineral water; and spa-like bathrooms with sensual Italian toiletries. This is a quiet hotel that appeals to refined luxury travelers. Monastero Santa Rosa is perched on a cliff overlooking the azure Tyrrhenian Sea on Southern Italy's Amalfi Coast, a luxury travel legend. The Amalfi Coast is not terribly hard to get to. The closest city, and airport, is Naples, an hour and a half's drive from the hotel. Monastero Santa Rosa operates a complimentary shuttle to the beach down below the hotel snot to places within a few miles. 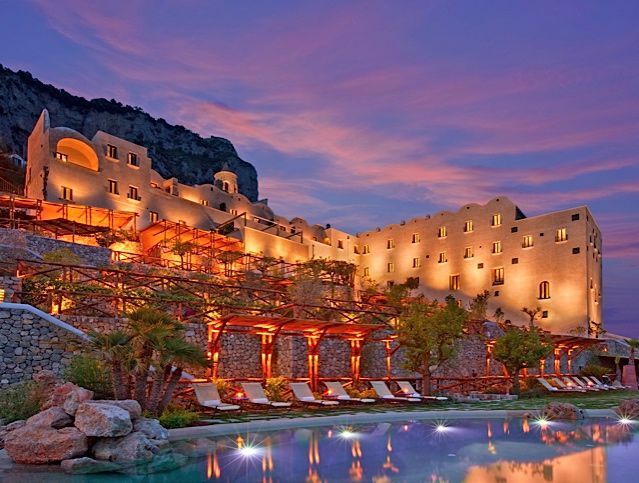 Monastero Santa Rosa is a luxury boutique hotel with only 20 accommodations. The hotel's building -- once a monastery -- is 400 years old, so rooms are all different. Yet they all flaunt vintage Italian elegance. Rooms retain their original vaulted ceilings, and are decorated with hand-chosen, one-of-a-kind furnishings, many antique. The 12 rooms and eight suites in Monastero Santa Rosa are named for herbs that grow in the property's herb garden. There are 10 styles of rooms. Most have king beds. Some have terraces. Many command not one but two spectacular views: the sapphire Bay of Naples and the rocky coastline. • Most rooms are pictured on the hotel's rooms page. All rooms and suites offer a built-in closet with a dresser and safe; LCD TVs; free, strong wifi; Italian mineral water; a minibar; fresh flowers. Monastero Santa Rosa's marble-everywhere bathrooms are exquisite. Mine had a walk-in, stone-tiled rainfall shower with a bench; a vast tub with a postcard view; a sink with ample counter space. The bathroom's generously sized toiletries included luscious, orangewater-scented balms made by Ortigia in Sicily and botanical bath salts from Santa Maria Novella in Florence. The Spa at Monastero Santa Rosa is uniquely set in the deepest, vaulted reaches of this 400-year-old building, in contemplative nooks that were once monks' cells. This exotic space, lit by sconces and candelabra, makes a spa indulgence feel like a Renaissance spiritual experience. The spa is full-service, with face and body treatments for women, men, and couples. Services are expertly performed by highly credentialed international aestheticians and massage therapists. Many treatments make use of lotions and potions concocted by the nuns of Santa Maria Novella in Florence. The hotel's Ristorante Santa Rosa is romantically set in a vaulted room made magical by candlelight and open sea views. The ristorante's outdoor terrace overlooking the sea is one of Italy's most inspired dinner settings. Lunch may be enjoyed at poolside or along one of the hotel's terraced paths. The restaurant's cuisine blends German-born chef Christoph Bob's Continental finesse with the traditions and bounty of the surrounding Campania region. Many of the restaurant's ingredients, such as its Pastificio dei Campi pasta and its olive oils, are produced exclusively for the hotel. Most of the kitchen's vegetables and herbs are grown right on-property. The result: Chef Christoph''s dishes could not taste fresher. His pasta and just-caught seafood dishes are not to be missed. Breakfast, included with room rates, offers both an elegant buffet and an a la carte menu. Guest may enjoy their breakfast indoors or outdoors, or as room service. The hotel's wine cellar is overseen by the young son of Monastero Santa Rosa's owner. This tasteful lady is an American widow who fell in love with the unrestored property at first sight from a yacht. Monastero Santa Rosa's bar offers lounge seating and café tables indoors and out. Hotel guests seeking to dine off-property have their choice of fashionable yet informal restaurants nearby, such as Lido Azzurra in Amalfi. As is common in the travel industry, the Expert was provided with a complimentary visit in order to describe the hotel. For more info, see our site's Ethics Policy.